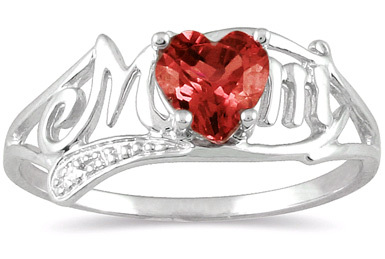 A 5mm x 5mm heart shaped garnet gemstone shines in the center of this lovely and unique "MOM" Ring crafted in 10K White Gold Gold. A .01 carat accent diamond sparkles underneath to give this simple and unique piece a very charming touch. For a soon-to-be, a newcomer, or a seasoned pro, this ring is a great gift sure to be appreciated. Ring head measures 15mm x 6mm. We guarantee our Garnet Heart Mom Ring with Diamonds in 10K White Gold to be high quality, authentic jewelry, as described above.